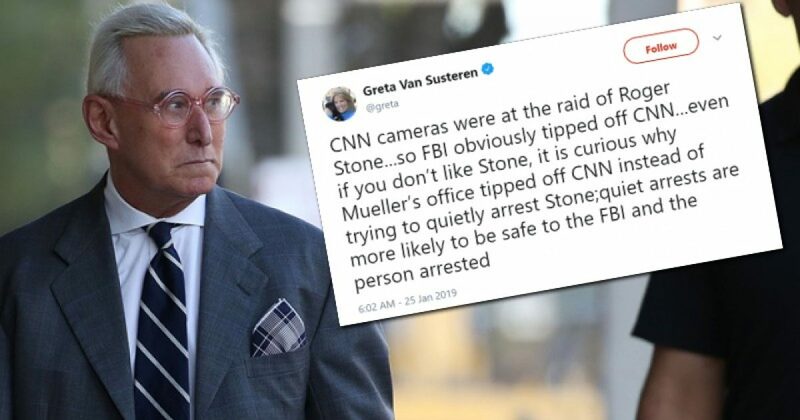 VIDEO: The FBI raided Roger Stone’s house in the dark of night and the Queen of Fake News, CNN, was there, waiting. Imagine that! Who tipped them off? Roger Stone was arrested in a dramatic dawn raid at his house by the FBI this morning. That isn’t the biggest news, in my opinion. The biggest news is that CNN was there, all ready for the big production, and reported the entire ordeal. CNN was the only news organization present (my apologies for using “CNN” and “news organization” in the same sentence). Why that is significant is that it confirms AGAIN the “collusion” between the deep state and CNN, the ratings for which are routinely bested by reruns of Yogi Bear cartoons. Not kidding! So, kinda’ makes you wonder where the Queen of Fake News is getting its revenue, doesn’t it? It can’t be from broadcasting news, as the only people watching are those trapped in airports and tire repair shop waiting rooms. I believe a full audit of CNN’s books is in order, including all financial records and bank deposits, as well as those of the major shareholders. Let’s see how the Queen of Fake News enjoys the treatment their talking heads literally beam about when reporting that same treatment of Trump associates. It was totally predictable that Mueller chose a big, high-visibility raid on a peaceful, non-violent guy he is trying to use to get to Trump, same as all the other arrests and interrogations like Manafort, Cohen, Corsi, et al., then invited the Queen of Fake News and champion Trump-hater CNN? I understand why President Trump hasn’t ended the witch hunt already. It is politically dangerous. If he fires Mueller, there will surely be an impeachment proceeding that will pass in the House and move to the Senate for trial, where the possibility of a conviction makes the move not worth the risk. However, there will come a point at which President Trump (or, preferably, his AG) must end the charade or allow it to devour him. Who knows what sorts of lies coward Cohen is telling right now to have his prison sentence reduced by a few years. What I don’t understand is why the Attorney General hasn’t ended the Mueller circus on his own. To anyone not blinded by TDS (Trump Derangement Syndrome), it is clear that there is no Russian collusion and there never was. THAT is what this special investigation was supposed to be investigating. Now that every Stone has been overturned (pun intended) to find Russian collusion and none has been found, end the investigation! I am anxiously awaiting the day an honest Attorney General begins the investigations of the swamp rats in the Democrat Party, the US Department of Justice, the FBI, and the mainstream media. America does everything better than any other country on the planet, including corruption. Despots, dictators, and druglords are, right now, taking notes from the American deep state. All CNN accomplished with this interview was to reinforce President Trump's argument that they were tipped off by Mueller. Nice try to set it up, CNN, you filthy, lying sacks of fake news. Not "everybody." Only those with at least two active brain cells, a group that unfortunately does not include those who vote for Democrats. Except, safety wasn't the goal. A big, high-viz, publicity stunt making Roger Stone look like Al Capone was the goal.